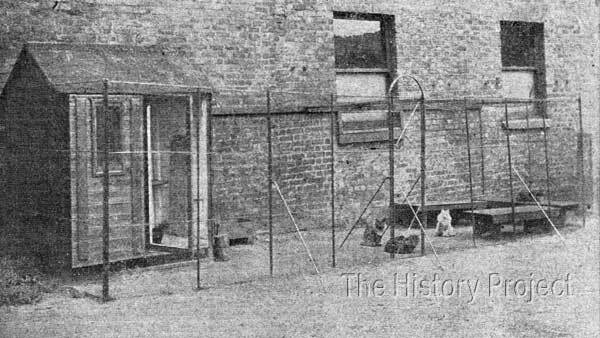 The owner of 'Maida', Miss A. Eggetts, ran a small cattery devoted largely to show neuters, but she also bred a few Blues, some Silvers, Smokes and Brown Tabbies. Her 'Broughton' prefix, like many English cattery names, came directly from her address, which was in the suburb of Higher Broughton, in central Manchester. 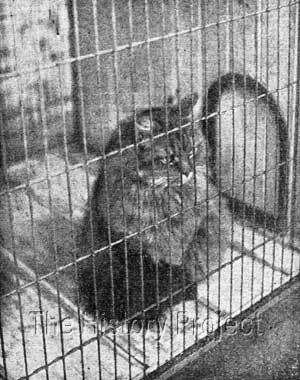 Fortunately, we have to hand, some snippets from a report by a correspondent of Our Cats magazine, who visited Miss Eggetts, and published the following commentaries in February 1903, about the same time as Mr. C.A.House published his book, CATS: Show and Pet, which featured a full page photo of 'Maida'. "On the morning of our visit, Phyllis had had the floor of her nursery washed, and meanwhile she and her basket of babies, had been moved into the adjacent room,Miss Eggett's own bedroom. Phyllis, not satisfied with her lowly position on the floor, was found with both her babies, not only upon her mistress' bed, but actually under the duvet!" 'Maida' was born on 30th March, 1896, She bred by Mrs Finnie Young and sired by her 'Blue Jacket' (1894)(NCC : 2009)and out of 'Bijou' (1894), who judging by other stud book entries ,had proven herself to be an excellent brood queen for Mrs Young. 'Maida' was subsequently sold to Miss Eggett. 'Maida's most famous relatives would appear to be her own 'sire-sibling', the blue-eyed white 'Crystal'(1898) and both her sire 'Ch. Blue Jacket' and his older full sibling, 'Ch. Patrick Blue'. Four full older siblings are recorded in a single litter bred by Mrs. Young, on 26th August, 1895. This litter comprised of three blue females and one blue male. Of the three females,'Dolce of Rhinsdale' and 'Beauty of Rhinsdale' appear to have been retained for breeding by Mrs. Young, with 'Beauty' being shown for a 2nd at Hamilton in 1895. The third female, 'Bon-Bon of Rhinsdale' appears to have been sold for breeding and changed hands, as there are litters recorded from her, bred by both Mrs. Foulds, and Mrs. Oliver. 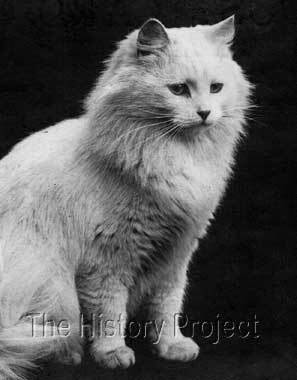 The fourth kitten, a male, was 'The Shah of Rhinsdale' who appears to have been registered as a neuter. One other full sibling 'Tot of the Downs', a blue female so named because she went to Mrs. Herbert Ransome, at The Downs, Altrincham, is recorded as being born in 1896, so it seems extremely likely that she was 'Maida's litter sister. As noted above, her most famous sire sibling, would undoubtedly have been the blue-eyed white 'Crystal' bred by Mr. A.Gearn and owned by Miss Hunt. Mr. Gearn produced another White female 'Aisha' from a repeat breeding of 'Ch. Blue Jacket' to his 'Lily White' and this female was purchased by Miss R.A. Packham. Aisha's eye colour is not recorded. Another sire-sibling was the blue female, 'Ayrshire Bluebell', bred by Mrs. Young from her queen 'Stella', and sold to Mrs. MacKenzie-Stewart. 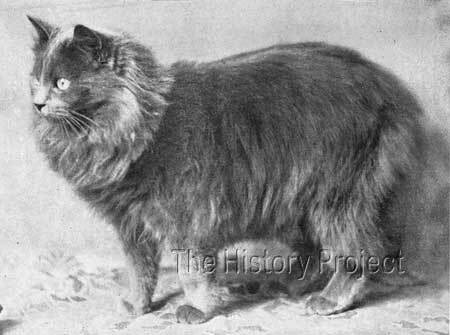 Bluebell subsequently appears on a number of later pedigrees. "Miss Eggett exhibited three of her neuters at the last Northern Counties Show, and took a prize with each! The prefix Broughton belongs to this cattery, so we will take it as said in future. Don is a very beautiful sound blue, by Nankipoo ex Maida. Bobs and Charlie, litter brothers, by Silver Laddie ex Broughton Phyllis, are as dissimilar as brothers often are. Bobs, whose photo, we reproduce,is a very richly coloured brown tabby, whilst Charlie is a sound smoke. Both were in excellent coat." Miss A Eggett's Blue Queen, 'Maida', winner of several prizes.